Bus 10 wil be diverted in Kuitinmäki from Tuesday 28 November to Friday 17 December due to construction work.The bus will not be able to run the the Kuunkehrä terminus and the terminus will be temrorarily relocated to Friisilänaukio. 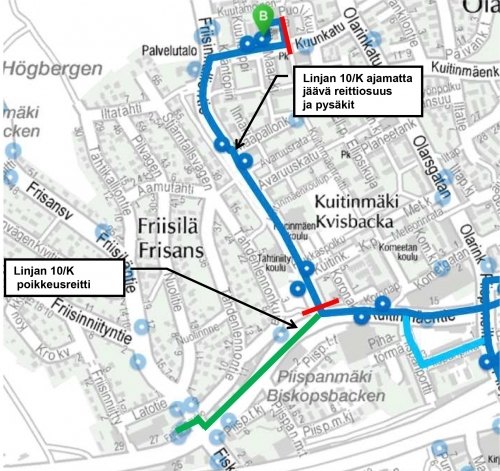 Bus 10 will not run via Friisinkalliontie, Kuunkatu and Kuunkehrä. Stops E3201, E3202, E3203, E3217, E3263 and E3265 will not be served. The bus will serve all stops along the diversion route.